I moved from Chandigarh to New Delhi in 2005. I really liked the city’s creative atmosphere although I must admit that it took me a while to feel a sense of belonging. 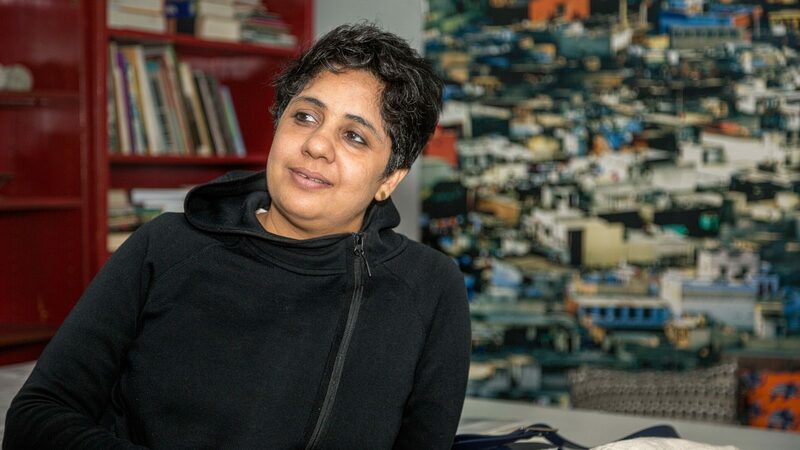 My connection with Delhi began while working on a project called Greenstone initiated by NDTV and NGO Swechha. That was when I actively started exploring public spaces and common resource pools like the Yamuna river, which I frequently visit to this day. In India, the ghats (or the steps leading down to the river) are often the centre of various activities like devotees meditating, bathing and praying to the ‘holy’ waters. However, in recent times, rivers like the Yamuna have turned into a cesspool carrying sewage, industrial waste and toxins. This blatant contradiction of purity and pollution has constantly irked and inspired me to contemplate about human behaviour in relation to water, health, politics, economy and the city’s overall environment and inhabitants. It provides endless food for thought for my creative appetite and practice. Of late, I have started focusing on urbanisation and migration – two issues that I am constantly faced with in this rapidly developing, cosmopolitan city. In April this year, I showcased several of my works at the Kunstmuseum Wolfsburg in Germany, as part of a group exhibition with artists Prajakta Potnis, Bharti Kher, Tejal Shah, Reena Saini Kallat and Mithu Sen. Curator Uta Ruhkamp chose works from the past decade and the final selection organically came to focus on and represent issues of the changing urban environment, centring on the five fundamental elements – air, water, earth, fire and space. 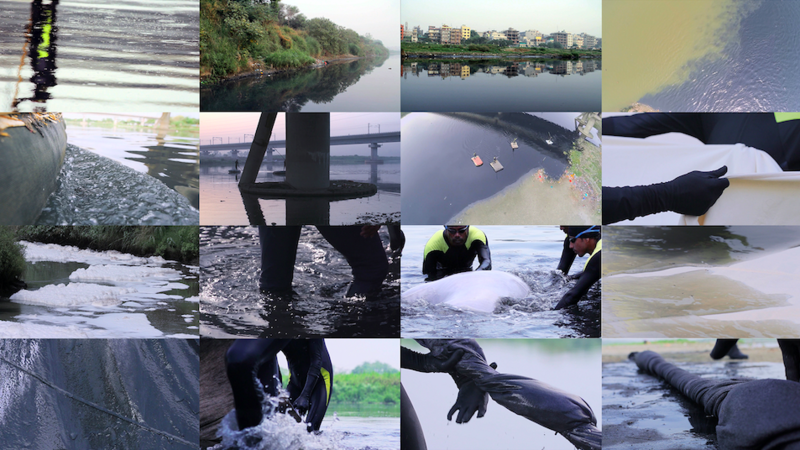 Among the works exhibited was my film Manthan (2015), meaning churning, which examines the ecological threat facing the sacred Yamuna river, its repercussions on the mortality of those who come in contact with it and the concerns it raises for the larger ecosystem of the city. In another video work titled Cleansing (2016), I perform the act of cleaning a plant layer by layer, leaf by leaf, slowly removing the dust mixed with oil and other pollutant particles accumulated over a period of time. This is a very zen-like exercise symbolic of cleaning and trying to preserve what our times are destroying. A series of staged and satirical photographs Negotiated Necessity (2008) and Breath by Breath (2016) is based on the present state of deteriorating air quality across the world and how new products like air purifiers and cans of fresh air are encouraging a culture of commodification of basic things like air. Finally, there were works like Time Symphony or Cacophony (2017), which are based on statistical research. This piece takes the form of an interactive sound wall archiving all kinds of unrest (social, political, religious, environmental, space war etc.) from around the world. Each is represented by different sounds, which come together to form a unique symphony. Which artists inspire your practice? I am interested in works that bring about or incite social change by highlighting urgent issues faced by a society and its people. I am very inspired by Olafur Eliasson’s social practice, especially his solar sunflower light project Little Sun. I am also influenced by Theaster Gates’s practice and Navjot Altaf’s community engagement. At present, I am really drawn to the work of the collective Forensic Architecture. Some of the artists that I like to follow are Ana Mendieta, Richard Serra, Anselm Keifer, Kara Walker, Sol LeWitt, Joseph Buyes, Jannis Kounellis, Kerry James Marshall, William Kentridge, Matthew Barney, Amar Kanwar, Edward Burtynsky, Nasreen Mohamedi, Magdalena Abakanowicz, Mrinalini Mukherjee, Nalini Malani and Stanley Brouwn. Every time I see or read about their work I learn something new! I have several favourites so it is difficult to pinpoint any one space. When I first came to the city, I thought Hauz Khas Village was an inspirational space as it represented a creative balance of galleries, artist and designer studios and historical heritage. During that time, I also visited the Sanskriti Kendra which offers an eclectic mix of programs, artistic discussions and food, leading me to eventually shift base to Delhi. Delhi is not just the political capital but also the cultural and creative capital of the country. It is home to a plethora of institutions like the Kiran Nadar Museum of Art, 24 Jor Bagh, Khoj International Artists’ Association, Odd Bird Theatre, Craft Museum, Indira Gandhi National Centre for Arts, National Gallery for Modern Art apart from being a host to the nation’s principal art event – India Art Fair. I am happy to see that private spaces like The Piano Man, Social etc. have been trying to create collaborative communities to foster a creative environment. One can surely witness the creative energies flowing in an organic way taking its own unique shape. I would like to effect change in our educational system which tends to ignore contemporaneity altogether, and fails to provide and promote a conducive atmosphere to encourage cultural practitioners to think globally or be engines of societal change. We need an environment where institutions rope in more professionals (rather than just academicians and politicians!) to encourage the youth to create and progress, rather than to settle for standard and safe careers. Vibha Galhotra was born in Chandigarh in 1978, and lives and works in New Delhi. 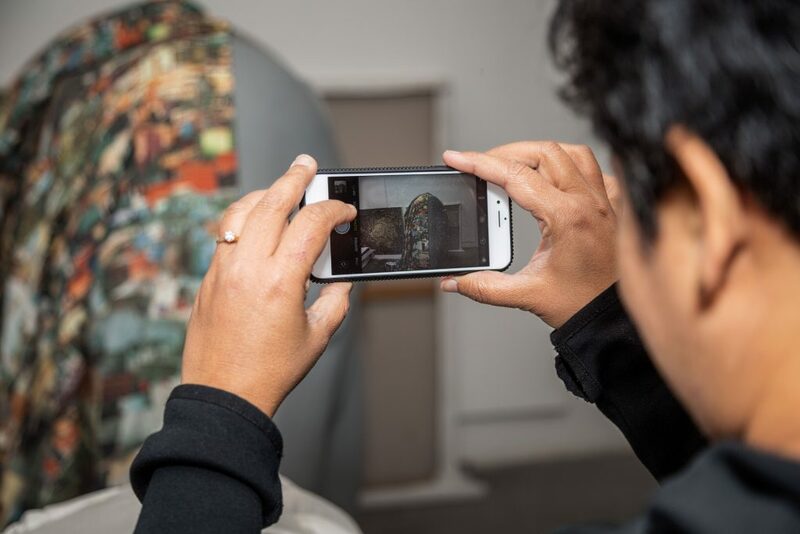 Her work includes sculptures, drawings, films and large-scale installations, each exploring environmental concerns and the changing face of culture, society and geography.